Ventriloquist/Guitarist Dave Parker and his friend Skippy are looking forward to getting everyone’s creative juices flowing when they perform at your library! Their lively show includes storytelling, comedy, puppetry, live music, and audience participation. As a treat for older patrons, Dave has been known to engage in the ultimate play-on-words by presenting Abbott and Costello’s hilarious “Who’s on First” as a dialog between himself and his talking baseball bat, Bat Man. Parker has a Bachelor of Science degree in Communication from the University of Wisconsin-Stevens Point and has been a professional ventriloquist since 1984. 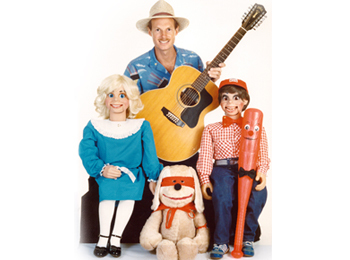 Skippy and Dave and company have performed over 2000 family-oriented shows all across the U.S.A. When he’s not on the road, Dave creates video adventures filmed with Skippy near their home in the Headwaters Region. Join Skippy and Dave and Friends as they celebrate the creative arts of music, language, and puppetry at your library!